A mother of 2 boys and a Certified Montessori Teacher teaching in a 3-6 class. We don't homeschool, but our home is full of a love of learning. 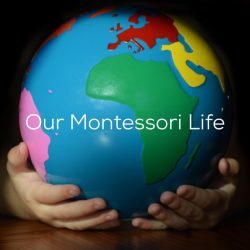 Most importantly, Montessori is not just school for us. It is our life. Spring is finally catching up here on the west coast of Canada and that means we are rummaging through our book shelves and rotating in all of our spring favourites. This book is absolutely stunning. We first purchased it in the Autumn, but Spring is one of my favourite seasons and I couldn’t help but share it now. We love the visual beauty of a well done pop up book. This one has so much to offer as well as some Montessori compatible text that adds to fostering a child’s curiosity. We also love adding some of our Schleich animals to create a small world open ended play scene at a nature table or on a mat. How are you rotating in materials into your space to fit with the changing seasons? This is a gorgeous new book from the best selling author of The Word Collector. Say Something by Peter H. Reynolds was released at the end of February and it has become one of our most valuable books I use in my classroom. It’s pages are done in the same simple style that showcase a number of powerful ways children can make their voice heard. We love that it is easy to read and can be shared with the youngest preschooler although this is an excellent book for opening dialogue with elementary students. This is a book that can be used both at home and in schools or communities with young children to empower those who may have trouble expressing themselves or don’t feel they belong or fit in. We especially need to show these children that they are loved, their voices matter but most importantly that they can make a difference. 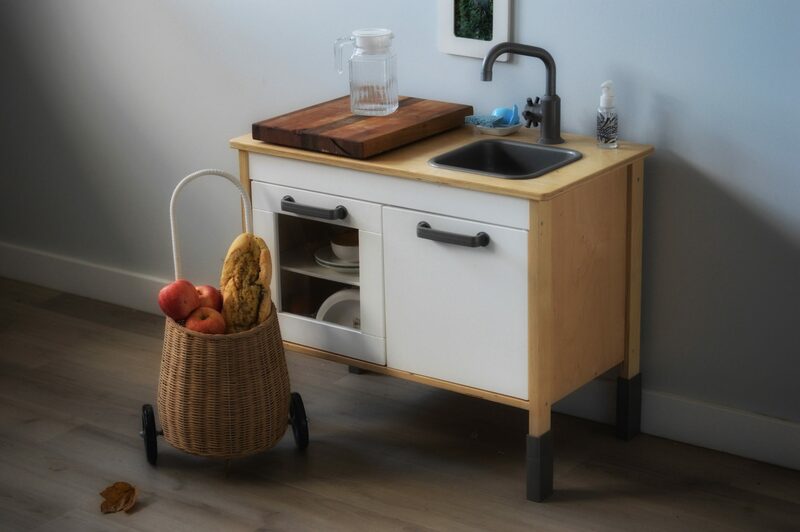 We absolutely love the independence a Montessori Child’s kitchen provides. Although Quentin mostly uses the regular height countertops of our home’s kitchen now at almost seven years old, he still uses his little kitchen for food prep. Of all the juices we have pressed over the years, grapes are his favourite. Here he is at 3 years old pressing them. And here he is today with the same little juicer that’s been going strong all these years. One of the reasons we love this juicer so much is that it is completely useable by even the youngest child. The hand crank and the plunger keep little fingers out of the way and the fact that it’s see though means you can observe every step of the juice extraction. The pulp exists at the end of the cone an we love examining that as well. The children in my 3-6 Montessori classroom are always fascinated by the entire process and lots of questions arise. We purchased our juicer all those years ago from here. If your child is hesitant about new flavours, hand pressed juice is often a favourite even if you mix two flavours together. It’s been a weekend full of sunshine and the promise of Spring here. And so I was thrilled to pull some gorgeous new language materials out of the postbox this weekend! If you follow us on Instagram you’ll know that we love following beautiful, hard working creative small businesses and Hobbs Farm is one of our absolute favourites. It’s even more wonderful that they are Canadian and they can be purchased here in Canada! I’m going to frame these beautiful alphabet cards to use as art in my 3-6 Montessori classroom’s Language area. Wishing you all a beautiful end to your weekend! This week as we prepare to partake in Canada’s Pink Shirt Day, we are continuing our book list of anti-bullying books that we love! My Secret Bully by Trudy Ludwig is an important book for not only elementary children but also their caregivers. Often we recognize bullying as loud, in your face, and clearly mean. But this isn’t always the case. Far too often relational aggression is at play with the consequences being just as harmful for the target. This book is perfect for reading at home or with students in the classroom. The watercolour illustrations compliment the story without taking over. The text is clear, easy to understand and empathize with for children beginning at 6 years of age. It focuses on the emotions felt by the target and the importance of a child listening to their body. It also touches on the importance of a target seeking help from a trusted caregiver and the important role the caregiver plays in ending the bullying. Books like this are perhaps difficult for an adult to read to a child, but children will often enjoy listening to them and love forming discussion groups about the topics portrayed in the pages. These are often the easiest way to reach out to children on both sides of bullying. The conversations that can be built on after reading these kinds of books hold within them a value that will last a lifetime. Listed in the end pages of this book are some excellent American organizations, global websites, and recommended readings for adults and children that all focus on relational aggression. During this upcoming week of Anti-Bullying we will continue to showcase books and activities that focus on empathy, acceptance and friendship. If you have a particular favourite resource please share it in the comments. We would love to feature it here or on our social media. February in Canada holds Valentine’s Day, Family Day and also Anti-Bullying Day. So many opportunities to continue conversations with children about empathy and continue our work in Peace Education. We’ve written about some of these titles before but today we wanted to focus on one we discovered by chance at our local library. This book was a delightful surprise. It is absolutely perfect for the 3-6 year old crowd. It’s simple text hides big conversation starters. We love the diversity within its pages and its powerful message. It’s the perfect sharing book for a group of children in a classroom or just simply with our own children at home. It explains that we are who we are, it’s ok to be who you are and that the feelings we feel are also what other people feel. This is an important first step in fostering empathy with young children. What books are you sharing with children in this month of love and kindness? When this book was featured to be released I knew we simply had to have it. So much so that when I found it wasn’t going to released here for a while I ordered it from overseas. We are big Shirley Hughes fans and I can remember being read her books as a child. This one didn’t disappoint. The end pages say it all. Her beautiful realistic artwork and simple yet rich text grab the reader right away. This book has the perfect mix of interesting ideas to make, as well as some lovely stories and poems. We used to make these simple paper lanterns when I was very young. As with all Shirley Hughes books they have a distinct British feel with simplicity at the heart of the text. This book can easily be lovingly tucked away each year, ready to bring out the next year to awaiting little ones. We hope you are enjoying a peaceful and restful weekend. Last year we waited patiently, while everyone was posting their “must haves” and “what to buys” and “favourite Christmas books evers” for this book to humbly be mentioned. And so, this year, we are posting a newly published beautiful, Montessori compatible Christmas book, that also hasn’t been anywhere on the usual Montessori social media Christmas posts. It is the simple hymn so many know. The story of a birth in a middle eastern town to a modest young Jewish family. When we are looking for Montessori compatible books, our first and most important goal is that they are reality based. Too often we see this story on book shelves with blond haired, blue eyed, and white skinned characters. This is why we love Silent Night by Lara Hawthorne. It’s pictures are stunning with bright beautiful colours, and lots for young children to look at. But most importantly, it does not whitewash this thousands of years old story. Maria Montessori implored us to build Peace, not only in ourselves, but in the world. The very best gift we can give our children is the knowledge that our stories are other people’s stories. That our differences are our similarities. It’s the first night of Hanukkah tonight and so I thought I’d share our absolute favourite books and activities to learn more about this beautiful holiday. Special candles we will light. This book is one of our favourites. Perfect for children new to the traditions of the holiday and packed with colour and rich inviting text. I love sharing this book with my 3-6 Montessori classroom as the children can easily identify the similarities they have with the children depicted despite not celebrating Hanukkah themselves. And that’s the most important goal of Montessori Peace Education isn’t it. To look outward into the world of others and find that they are not so “other” after all. If you’re looking for Hanukkah books pop over to Diamond Montessori’s Instagram feed. Ashley is an amazing AMI trained 3-6 Montessori Guide, a maker of beautiful Montessori materials but she is also our go to for inclusive and diverse books for all children. Luftmensch Designs have so many gorgeous materials. Their giant Montessori wall calendar is gorgeous and perfect for use in the classroom or at home. We hope everyone celebrating Hanukkah this week has bright, warm and happy times with family. If you have a Hanukkah tradition you do in your home we’d love you to share in the comments.